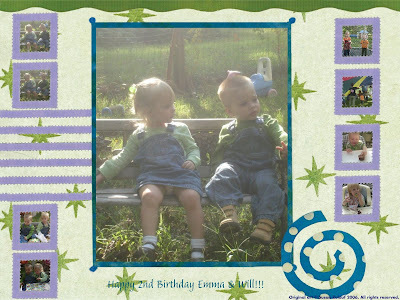 Debi had a great idea for me to just combine my fotos from Emma and Will's B-day party with Candid Carrie's Friday Foto Finish Fiesta so that I could cut down on my "to do" list :) So here are some adorable fotos from our phun, phun day. I can't believe they're already TWO years old!!! Where has the time gone? (You should be able to doubleclick on the picture page below to make it a little bigger for viewing the teeny pics). Make sure to head over to Candid Carrie's for more phantastic fotos! awwwww....that is such a cute photo in the center!! They all look too cute! Love the picture of them on the bench. Too Cute! OMgosh! These turned out so cute! I think I need a copy of some of these pics!!! !